Engaging youth and fostering their participation is increasingly recognized as an important means in effectively improving their health and wellbeing. Empowerment of youth is crucial, especially for underserved youth. People working in health and social services are very important partners to support youth in gaining leadership and life skills contributing to their health and wellbeing, as well as the health of their families and communities. Health literacy is found to be an important life skill as it is seen as a crucial aspect in determining and having control over one’s health. It is recognized as being critical to empowered, active and informed participation in health and healthcare. Even though health literacy is recognized as being important to empower people, research has largely focused on adults. There are many questions we still do not know about youth and health literacy. For instance, youth’s strengths and assets in addressing risks and protective factors have insufficiently been recognized, and youth’s perspectives on what constitutes health and what factors influence health are relatively unknown. To date, health literacy has been largely viewed through an individual, healthcare lens, in which broader factors affecting health seem to be ignored. These social factors are important to consider if we view health in an inclusive, holistic way. Bridge for Health recognizes the importance of such a holistic approach to health and encourages upstream thinking. Building on holistic health literacy and upstream thinking, in 2014 Bridge for Health developed Moving Upstream: Youth Engagement Photovoice Research Project. 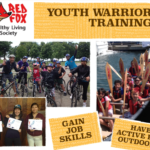 The project was a collaborative endeavour with community partners RedFox Healthy Living Society, Big Brothers of Greater Vancouver and United Way Lower Mainland to support youth in gaining leadership and life skills contributing to their health and wellbeing. The project was carried out through the existing Youth Warrior Program, aimed to enable youth (aged 15-18 years old) to have more control over their health and wellbeing, as well as that of their communities and families. Through this Photovoice project, the youth were asked to capture elements/factors presenting their life which are affecting their health and wellbeing, and that of their families and communities. The photographs taken by the youth were presented on December 17th, 2014. Bridge for Health Project investigated prevailing needs and concerns of youth, so that future initiatives can incorporate this knowledge in the future development of health literacy tools targeted at youth. These tools can support youth in understanding the broader factors in life influencing their health and wellbeing, and thus contribute to increased holistic health literacy levels. The project aimed to foster holistic health literacy levels of youth by increasing their critical consciousness through participation in the program, as well as learning about the social factors affecting their health and wellbeing. ← The Circle of Health as a tool for citizen engagement and social innovation. Working Together for Social Good!